The printed circuit board industry is full of specific terminology and acronyms. The following is a list of common terms that might come in handy both if you are in the business, or just curious about it. A series of holes in successive layers of a multi-layer board each set having their centers on the same axis. These holes provide access to the surface of the land on one of the layers of the board. An adhesive used to bond Multi-layered ﬂex circuits together and also used to adhere the Coverlay used on ﬂex layers / boards. Aluminum is a metal often used as a conductor or packaging material. It is also sometimes used to wrap up leftovers. Unwrap them before heating in the microwave! The portion of conductive material completely surrounding a plated hole or via. This is found on inner and outer layers. 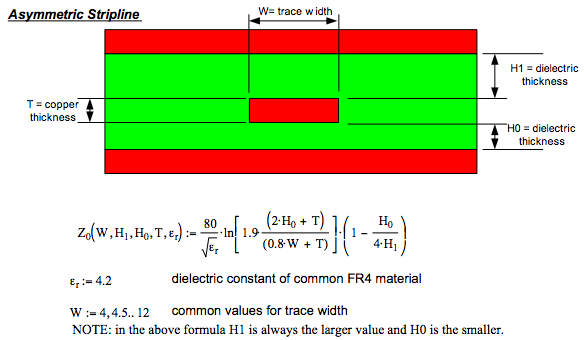 Similar to the symmetric stripline except that the dielectric thickness above and below the trace are different. The material is typically of the same kind. A drawing describing the locations of components on a PCB. This is the coverlay material that is used to insulate the circuitry on the ﬂexible layers. This coverlay is ﬂexible as well. This material only partially covers the ﬂexible layer and should not extend more than .050” into the rigid portion of the board. A tolerance in which variation is permitted in both directions from the specified dimension. The region on a base material that is external to that of the end product being fabricated within it. An epoxy resin containing chemically bound bromine, which is added to act as a ﬂame retardant. Button Print and PlatingThis is where the pad and holes are imaged and plated in lieu of the entire layer pattern. This is typically done on ﬂex product to reduce cracking of the signals caused by hydrogen embrittlement introduced during the electro plating process. This is where the pad and holes are imaged and plated in lieu of the entire layer pattern. This is typically done on ﬂex product to reduce cracking of the signals caused by hydrogen embrittlement introduced during the electro plating process. A process for making multi-layer printed boards with surface layers of metal-clad laminate bonded in a single operation. CEM = Composite Epoxy Material) is very similar to FR-4. Instead of woven glass fabric a “flies” type is used. CEM-3 has a milky white color and is very smooth. It is a complete replacement of FR-4. CEM-1 is is a paper based laminate with one layer of woven glass fabric.It is not suitable for Plated Through Hole, same as FR1-3. CEM-1 is used for single sided PCBs. A crack or void in the plating extending around the entire circumference of as plated through hole, a solder ﬁllet around lead wire or eyelet, or the interface between a solder ﬁllet and a land. A hole in a conductive pattern that is larger than and coaxial with a hole in the base material of a printed board. Similar to the “embedded microstrip”, differing from it because of the dielectric thinness on top and the construction process. The dielectric on top is usually the solder mask coating the PCB surface. 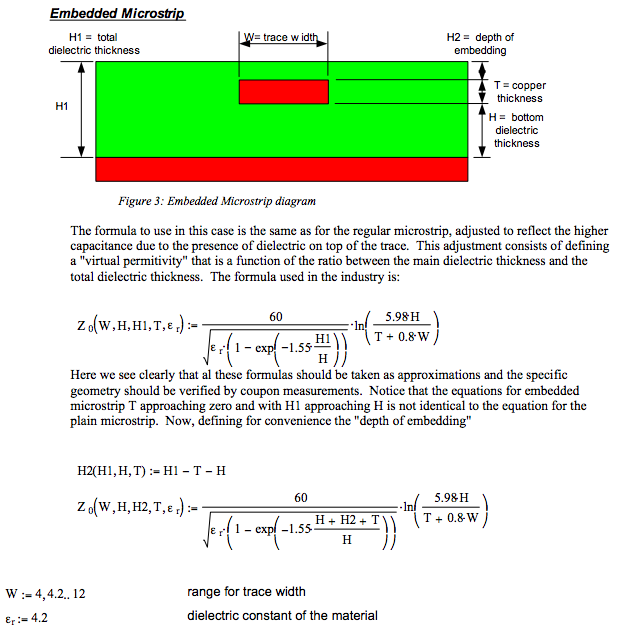 It is an extreme case of Embedded Microstrip with different dielectric constant than the material below. Z-CTE are measured as PPM per oC, or as the total material expansion from 50-260oC, in % of thickness. It is specially interesting to know the thermal expansion above Tg, where the expansion rate exellerates rapidely. Here you can sort the good from the ”less good” laminates! CTE values are important since they influence the reliability of the finished circuit. What is Comparative Tracking Index(CTI)? Here CTI is a quality item that refers to copper clad laminate which is widely used in home electrical appliance or other high-voltage(110V, 220V) electrical apparatus. It is a simulated conditon that the PCB is polluted in its working environment, which result in leakage or short-circuit at the track gap of the PCB surface, being accompanied by heat releasing and charring. The way of experiment is that continous 50 drops of 0.1% ammonium chloride solution are dropped between two points on the PCB surface, 30 seconds per drop, turning on high voltage AC current to do the test. Firstly trying 300V to generate 1A current. There’s ammonium chloride solution on the surface, so after current is switched on it will produce resistance who also bring out heat, then the solution is slowly evaporated. 2nd drop is on and till to 50 drops to see if the PCB has leakage or not. Once the PCB has 0.1A creepage and exceeds 0.5 seconds, it’s judged Failure. The quality of CTI of laminate refers to the externally applied voltage value and without failure of 50 drops. If abovementioned 300V passed, we can increase the voltage to 400V, 500V or 600V till to the high value before failure, that is the data of the laminite CTI. Bicheng offers high CTI PCB’s (high CTI 600V FR-4 and aluminum backed material) which is working in such harsh environment of high voltage, filth and humidity. Production master or artwork data that has been enlarged or reduced in order to meet the needs of subsequent processing requirements. The thickness of the conductor including all metallic coatings, non-conductive coatings excluded. Acrylic resin (AR): Acrylics are fairly easy to apply and dry rapidly, reaching optimum physical properties in minutes, while providing a long pot life. advantage, as it makes them the easiest coatings to rework. properties, these characteristics also become their drawbacks in that chemical and mechanical removal techniques may become difficult and costly. methods due to abrasion resistance. coating removal, but rather the removal of residues that may be left from the coating. * Recent correction to table. Tempco value is at 20 degrees C (it’s a slight function of temperature). PCB fabrication process that piles up core materials with intermediate prepeg material. This method always results in an even number of layers. The layer of insulating material that is applied covering over a conductive pattern on the outer surfaces of a printed board. An internal condition that occurs in reinforced laminate base material whereby glass ﬁbers are separated from the resin at the weave intersections. (This condition manifests itself in the form of connected white spots or crosses that are below the surface of the base material.) It is usually related to mechanically induced stress. The breaking up of large conductive areas by the use of a pattern of voids in the conductive material. Marking of products to indicate their date of manufacture. The decomposition temperature is a measure of actual chemical and physical degradation of the resin system. This test uses thermo-gravimetric analysis (TGA), which measures the mass of a sample versus temperature. Any non conformance to specified requirements by a unit or product. Metallic ﬁlaments that grow between conductors in the presence of condensed moisture and an electric bias. The ratio of the capacitance of a conﬁguration of electrodes with a speciﬁc material as the dielectric between them to the capacitance of the same electrode conﬁguration with a vacuum or air as the dielectric. The maximum voltage that a dielectric can withstand under speciﬁed conditions without resulting in a voltage breakdown, usually expressed as volts per unit dimension. The converting of feature locations on a ﬂat plane to its digital representation in X-Y coordinates. A meassure index of the tendency of an insulating material to absorb some of the ac energy from electromagnetic field passing through it. Low values are important for RF applications, but relatively unimportant for logical applications. is the primary glass used in yarns that are used to construct fiberglass fabrics, and is the least expensive among the three, E-glass, S-Glass or NE-Glass. A metal foil that is produced by electro deposition of the metal onto a material acting as a cathode. The voltage per unit thickness of an insulator at which an arc may develop through insulator. Unwanted electromagnetic energy that may couple into electrical circuits and adversely affect their performance. The rapid spontaneous transfer of electrostatic charge, induced by a high electrostatic field. The increase in length of a material that is caused by a tensile load. Similar to the plain or “surface microstrip” but buried into the dielectric material. A document that discloses the physical and functional end-product requirements of an item by means of pictorial and/or textual presentations. The ratio of the depth of etch to the amount of lateral etch, i.e., the ratio of conductor thickness to the amount of undercut. The process inherently causes the copper land to be recessed in from the edge of the hole walls. bonding to the copper land of the different layers within the PCB structure. holes manufactured with an Etchback (Positive) process is the solution. This process causes the dielectric material in the hole walls to be etched back, causing the copper land to protrude out past the edge of the hole walls. metal fatigue due to mechanical stresses imposed by both external mechanical shock and thermal shock. Etchback (positive) is seen as a better solution for applications requiring the highest levels of reliability. A printed board artwork feature (or features) that is created in the same process as the conductive pattern and that provides a common measurable point for component mounting with respect to a land pattern or land patterns. A sample part or assembly manufactured prior to the start of production for the purpose of assuring that the manufacturer is capable of producing a product that will meet specified requirements. Flux:The material used to remove oxides from metal surfaces and enable wetting of the metal with solder. use an even number due to the risk of warpage and cost (it is usually cheaper to add a layer). A process for making multilayer printed boards with surface layer(s) of metal foil bonded in a single operation. FR-1 is basically the same as FR-2. FR-1 has a higher TG of 130°C instead of 105°C for FR-2. Some laminate manufacturers who produce FR-1 may not produce FR-2 since the cost and usage are similar and it is not cost effective for having both. Usally used for 1-2 layer boards without connection through the holes. FR2 laminates are composed of multiple plies of cellulose (‘Kraft’) paper that have been impregnated with a flame-retardant phenolic resin. FR-2 laminate is less expensive than FR-4, and the cost difference becomes even greater for the finished board, because holes and profile can be created by punching. FR-2 is typically used in applications where tight dimensional stability is not required, such as in radios, calculators, toys, and television games. FR-2 is an opaque brown in colour. Usally used for 1-2 layer boards without connection through the holes. FR-3 is is also basically FR-2. But instead of phenolic resin it uses an epoxy resin binder. Not recommended for multilayer builds. An additive process wherein the entire thickness of electrically- isolated conductors is obtained by the use of electroless deposition. GaAs is the semiconductor that spawned the entire MMIC industry. In addition to it’s great semiconductor properties, it is also an excellent substrate for microwaves because its resistivity is so high (much higher than even “high resistivity” silicon). GaAs wafers are usually referred to as semi-insulating. GaAs also has very low loss tangent. This data came from various sources including TriQuint and Avago. Some of this info came from Russia’s Ioffe Institute. The temperature at which an amorphous polymer, or the amorphous regions in a partially crystalline polymer, changes from being in a hard and relatively brittle condition to being in a viscous or rubbery condition. Tg is important to understand since the properties of base materials are different above the Tg versus below the Tg. Removed portions of a ground plane that isolate it from a hole in the base material to which the plane is attached. Mechanically induced fracturing or delamination, on or below the surface of a base material that is usually exhibited by a light area around holes or other machined features. Ultra fine-geometry multi layer PCB constructed with conductive surface Microvia connections between layers. These boards also usually include buried and/or blind vias are made by sequential lamination. A mechanical device that is made of a high thermal-conductivity and low speciﬁc-heat material that dissipates heat generated by a component or assembly. Any copper feature location relative to the nearest drilled hole, measured without plating. A void in the metallic deposit of a plated-through hole that exposes the base material. A conductor that connects conductive patterns on internal layers of a multilayer printed board, e.g. a plated-through hole. A conductive pattern that is contained entirely within a multilayer printed board. Dual Head Laser, UV – copper ablating laser and CO2 – Dielectric ablating laser. The degree of conformity of a conductive pattern, or portion thereof, to that of any other conductor layer of a printed board. The thickness of dielectric material between adjacent layers of conductive patterns in a printed board. A land that has fully or partially separated (lifted) from the base material, whether or not any resin is lifted with the land. A document that shows the dimensional limits or grid locations that are applicable to any and all parts of a product to be fabricated, including the arrangement of conductors and nonconductive patterns or elements; the size, type, and location of holes; and all other necessary information. The simultaneous lamination of a number of pre-etched, multiple-image, C-staged resin panels or sheets that are sandwiched between layers of B-staged resin and copper foil. Metal Core Printed Circuit Pcb. Base material covered with conductive foil on one or both sides. Consists of a trace running on the surface of a PCB separated by one or more layers of dielectric material from a ground plane located underneath. It is also called “surface microstrip” to distinguish it from the “coated” or “embedded” variations. Usually defined as a conductive hole with a diameter of 0.15mm or less that connects layers of a multilayer PCB. Often used to refer to any small geometry connecting hole the creation of which is beyond the tradition practical drilling capabilities. The ﬂared condition of copper on an inner conductive layer of a multilayer printed board that is caused by hole drilling. NE-glass has improved electrical and mechanical performance over E-glass and is typical used in the Nelco 4000-13SI and N6000-21SI high-performance laminate product lines. Surface PCB finish, thickness 0.3um. Typical use = soldering. The gaseous emission from a laminate printed board or component when the board or the printed board assembly is exposed to heat or reduced air pressure, or both. The description of copper and dielectric layers constituting a PCB, specifying each thickness. It consists of a number of pre-peg, cores and copper layers. Since the optimum padstack is PCB fab technology dependent, it is always a good idea to check a proposed padstack with your PCB manufacturer. A rectangular sheet of base material or metal-clad material of predetermined size that is used for the processing of one or more printed boards and, when required, one or more test coupons. A document that shows the production master with related manufacturing patterns and artifacts that relate to the fabrication of printed boards. The plating of an entire surface of a panel including holes. This coverlay is typically used in the manufacture of Rigid-Flex boards where the coverlay material is only in the ﬂexible portion of the board. This removes acrylic adhesive from the rigid portions of the board increasing board reliability. The force per unit width that is required to peel a conductor foil from a laminate perpendicular to the surface of the substrate. Developed by Baekeland and Thuslow in the early 1900s, the products formed by the condensation of phenols with formaldehyde were sold as Bakelite and Novolac. Phenol-formaldehyde resins (phenolics) were the first thermosets to be used for electrical laminates because they are easy to process and have good resistance to heat and chemicals. A material that is sensitive to portions of the light spectrum and that, when properly exposed can mask portions of a base metal with a high degree of integrity. An exposed and developed image in a coating on a base material. An imperfection in the form of a small hole that penetrates entirely through a layer of material. A clear defect that is completely within a black pattern or in the black background of a clear pattern. An imperfection in the form of a small hole that does not penetrate entirely through a layer of foil. A component package with J-leads. Heat aging in order to stabilize material through stress relieving. The protective barrier material used in the manufacture of Rigid-Flex Boards. This material is typically removed from the ﬂexible portion of the board prior to shipment. The pouch is Covercoat material used to protect the exposed ﬂexible materials during the normal processing of the rigid-ﬂex boards. Most PCB manufacturers currently utilize five types of prepreg with 106, 1080, 2116, 1500 and 7628 glass styles. Due to various limitations as to the number of plies and/or types of prepreg that can be utilized between layers of a board, specific applications need to be discussed with the PCB manufacturer. Not all styles are common in all markeds. A stylized pattern (symbol) that is used as a reference point for registration. The presence of voids between the plating of a plated-through hole and the wall of the hole as seen in micro sections of plated-through holes that have been exposed to high temperatures. The location in a printed board of a signiﬁcant thickness of un-reinforced surface-layer resin that is of the same composition as the resin within the base material. In an effort to support the RoHS initiative, Sunstone Circuits offers several options that comply with the directive. All of the laminate material, soldermask material, and silkscreen material supplied are compatible for assembly at lead free solder temperatures and do not contain (above the upper limits) any of the restricted materials. 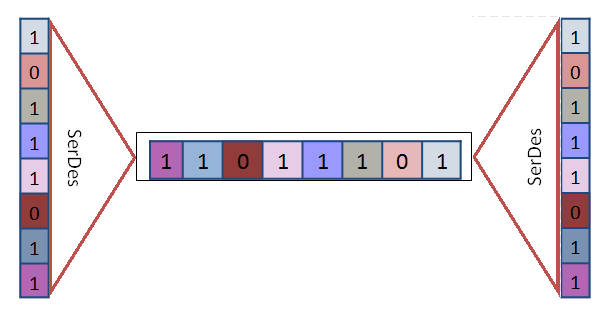 The sum of the cumulative-pitch error across a number of functional patterns on a step-and-repeat photo tool. A pair of functional blocks commonly used in high speed communications to compensate for limited input/output. These blocks convert data between serial data and parallel interfaces in each direction. The term “SerDes” generically refers to interfaces used in various technologies and applications. The primary use of a SerDes is to provide data transmission over a single/differential line in order to minimize the number of I/O pins and interconnects. The force required to shear adhesive-bonded (and cured) materials and/or components. A fault that causes to be connected two or more points that are normally electrically separated. An individual conductor that is used to transmit an impressed electrical signal. Silver provides the best electrical conductivity of all metals. It is an order of magnitude less expensive than gold, but it has a tendency to tarnish (oxidize). It is often used in low-loss waveguide components. The silver oxide layer is typically less than a skin depth so it has little effect on electrical loss. Silver pastes are often used in LTCC products in place of more expensive gold conductors. Traces that are neither parallel nor intersecting with the glass pattern. A heat-resisting coating material applied to selected areas to prevent the deposition of solder upon those areas during subsequent soldering. A band of wire removes molten solder away from a solder joining or a solder bridge or just for desoldering. Statistical Process Control. The collection of process data and creation of control charting is a tool used to monitor processes and to assure that they remain In Control or stable. Control charts help distinguish process variation due to assignable causes from those due to unassignable causes. A stiffener is a piece of material that is bonded to the printed board to provide mechanical support. A stiffener will be evaluated only as a mechanical support. Void-free bonding of the stiffener to the ﬂexible printed wiring is not required. Speciﬁc requirements shall be as agreed upon between user and supplier. A receptacle connector device that prevents the disturbance of the contact and cable terminations. Trace running between two ground planes. See under the “symmetric” and “asymmetric” variations. This geometry consists of a trace running between two ground planes located in layers above and below with the same dielectric thickness and material on both sides. Materials that have four reactive groups per molecule. The property of a material that describes the rate at which heat will be conducted through a unit area of the material for a given driving force. The absolute difference between the thermal expansion of two components or materials. The crosshatching of a ground or voltage plane that minimizes blistering or warping during soldering operations. A metal-integrity evaluation zone that extends a speciﬁed distance beyond the ends of the lands in a micro section of a vertical portion of a plated-through hole. (Unless otherwise speciﬁed, the- extended distance is 0.08 mm (0.003-inch). A plastic that undergoes a chemical reaction when exposed to elevated temperatures that leads to it having a relatively infusible or cross-linked stated that cannot be softened or reshaped by subsequent heating. The time to delamination is a measure of the time it takes for the resin and copper, or resin and reinforcement, to separate or delaminate. Bring a sample to a specified temperature – measure the time it takes for failure to occur. With Pb-free assembly temperatures reaching above 260oC, T288/300 have become a relevant measure of performance. A hole in a printed board that does not contain plating or other type of conductive reinforcement. A metal foil that is formed by the rolling of cast metal. The vertical or bottom-to-top direction in a two dimensional system of coordinates.